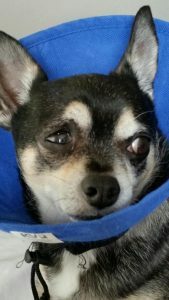 Harley is a beloved Chihuahua who had a very sore right eye with irritation, tearing, and light sensitivity. He was diagnosed with a corneal ulcer and treated with antibiotic and lubricant eye drops. However, Harley did not respond to the medications and his eye continued to be very sore and light sensitive. Harley’s pet Mom was very concerned and so she contacted me and sent in his information along with a current picture. 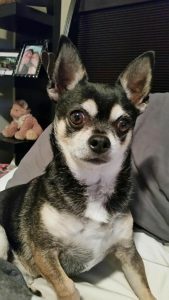 Harley’s condition was acute so I prioritized his case and planned on doing his health work-up the next day to formulate an appropriate program to address his eye problem. However, that evening I decided to look at his picture, but about an hour later I was surprised that my own right eye started to hurt, and it continued to be sore for several hours until I went to bed. Then, in the middle of the night I was suddenly awakened. I could feel his energy and saw a fuzzy visual of his eye ulcer coming straight at me. It somehow energetically hit my right leg and I could physically feel it on the outside of my lower right calf. It felt like the eye had embedded itself in my leg and I could sense the word “healing”. I was somewhat bewildered until the next morning when Lindsay called to ask me what I had done! When she got up that morning Harley had experienced an instantaneous healing, and he was completely recovered. And my own right eye and leg were fine by then too. Lindsay took Harley to his veterinarian to check it one more time but there was no sign of a corneal ulcer. Apparently little Harley had used the healing frequencies in my energy field to help his eye! Although to this day, I don’t know why he aimed for my leg! Some healing mysteries are never solved. For more information about my dog and cat consultations, click here. What an an awesome, magical, happy-ending, story! Your remedies have helped my equines so much over the past several years and I am always so appreciative, Marijke, for your guidance, advice and support. Thank you! P.S. Think Harley maybe aimed for your leg, merely because he is so short … LOL. What a wonderful post! Thank you for sharing it with us!! !